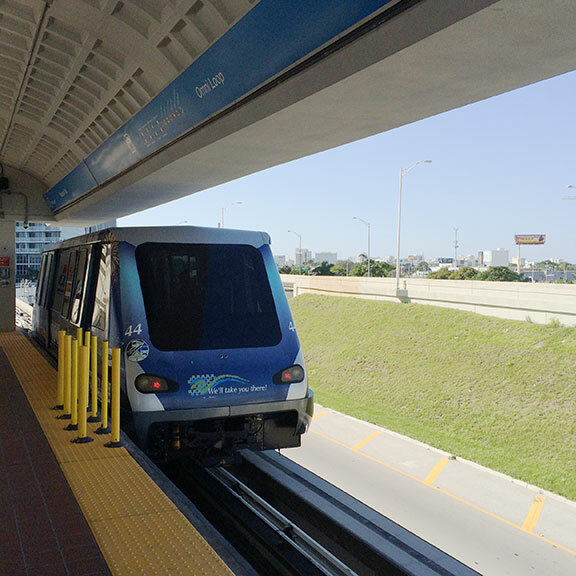 County transit officials are analyzing extensions for the Metromover and upgrades for all its systems toward accommodating increasing ridership. Director of Transportation and Public Works Alice Bravo said right now her department is evaluating various expansions, including one to the north for the Midtown area; the south to close the Brickell loop; the west for the Marlins Stadium area; and Miami Beach over the MacArthur Causeway to Fifth Street and Alton Road that would serve as a beach corridor. In the interim, Ms. Bravo said, the department is working on a procurement package to upgrade all Metromover systems such as computers and electronics. The free transportation service, also called the peoplemover, has all its original systems, which Ms. Bravo said limits the county’s ability to add any new vehicles. The latest statistics on the department’s website show Metromover’s November ridership at 841,679, up 1.6% from November 2015. In the same month, Metrobus ridership was 5,181,524, down 5.5% from November 2015, and Metrorail ridership was 1,734,267, down 1.6% from November 2015. Metromover’s ridership in October 2016, however, was down 9.4% from October 2015 and in September it was down 1.3% from September 2015, the county’s figures show. Committee members asked if the Metromover cars, once upgraded, might be used in some way for the Strategic Miami Rapid Transit Area (SMART) plan, given how expensive the estimated cost is for six corridors. The pacing has to do with spacing of stations and the number of stops, Ms. Bravo said. Basically, she explained, it’s possible for the vehicles to travel at 30 miles per hour or more, so one could travel from Midtown to the Beach. However, Ms. Bravo said, what the department is particularly looking at now is how the trains would operate. For example, she said, if a person boards at Government Center and is going to Miami Beach, it might be better to skip some stops. Everything having to do with transportation is interrelated, Ms. Bravo agreed. The other municipalities and agencies such as Miami’s Downtown Development Authority are focused on the SMART plan, as it all has to do with the county’s economy and future growth. As long as the MetroMover cars can be engineered to go faster– 50mph sounds good– and chained together in such a manner that they can carry large numbers of people– they would make a great BayLink. But why stop at Alton and 5th? Run it all the way to the Convention Center with a stop on the beach. That is how you’ll get lots of cars off the road and make getting around the beach a whole lot easier. The reason for stopping on 5th I suppose is because the county would be footing the bill. Maybe they intend the City of Miami Beach to join in and do their part by paying for the rest. I think that’s reasonable enough. Agreed! When you say ” a stop on the beach” where exactly do you envision this and what does it look like? Thanks! I really liked this plan. I’m curious as to how it would work now with the new ballpark location but really like the idea of running grade level on the MacArthur Causeway and having something along the sand looks amazing! I’m kind of a geek when it comes to our transportation ideas / solutions and hope we get something just like this at the end. Moving it to Marlins Park is a smart idea. We can use those useless parking spots and have a comprehensive system. Of course PeopleMover ridership is up. IT’S FREE!!! How do you get Metromover data when it is free? The Homeless population would throw off the data, especially on the Omni loop! I live in the Brickell area and would love the access to Miami Beach and Midtown from right outside my door! There are still IR scanners at the station entrances that count entry and exit. I’ve been a life long resident and I always get really excited when discussions are held resolving our traffic issues, but come on. How much longer do we have to wait for these projects to get going? We’ve had tons of studies (since early 2000) and so-called experts letting us know what we should do and what would work best for our city ,including baylink. Get the PPP going and start expanding. We know they are looking for money but you’re not going to find it anymore in the “county couch’ in between the cushions. As citizens we are tapped out. Get private companies to put money in and help fund these projects. I was really hoping there would be a line to West Kendall and FIU to alleviate some of the congestion in those areas. But there is. They are proposing Metro Rail expansion to FIU. The problem is it will be at grade alongside the Dolphin from the MIC to FIU only elevating once it has to go over the Dolphin to turn south to get to the campus. As far as the Kendal corridor is concerned I think they want either BRT or heavy rail as well going down the median of Kendall Drive. Me too! If we get something other than a dedicated bus lane from F.I.U and West Kendall to downtown that would really make a HUGE difference for the S.W. area. I really believe that the Tri-rail expansion with more local stops (parallel to I-95) is going to help with that corner of the county. Track bed already exists for an extension to Midtown. Would need to work on how to cross some very busy intersections though. Cheers.